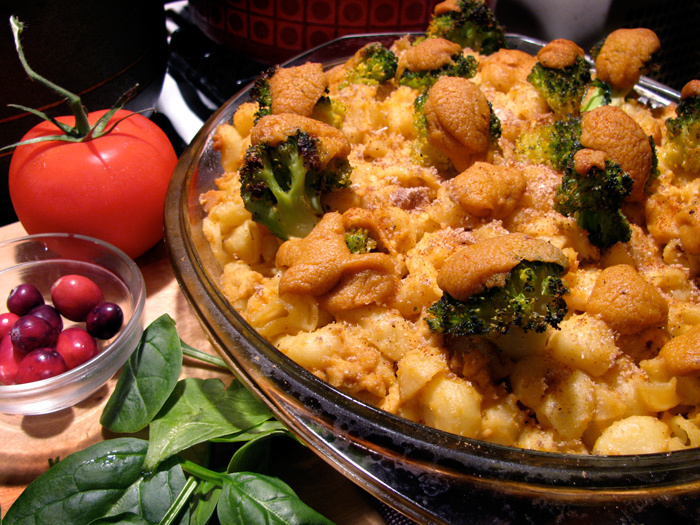 This is my twist on the most classic vegan comfort food: baked mac and faux-cheese. It’s evolved over the years — usually I make this with some of the variations listed. Especially for newbies to nutritional yeast, adding a puréed tomato and some tomato concentrate gives a fuller, rounder more familiar flavor. Use less margarine or oil if you like; just adjust the liquid accordingly so your cheeze doesn’t end up too thick. For the crumbs, I usually food process one or two slices of toasted bread or a handful of crackers.